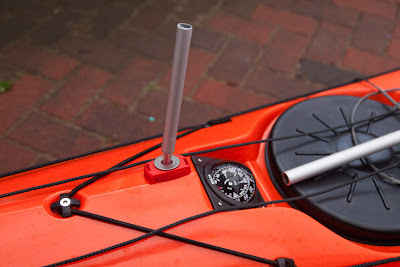 Flat Earth Kayak Sails news! An exciting package arrived at Seakayakphoto Towers yesterday. Its elongated shape and Australian postmark had me salivating in anticipation. 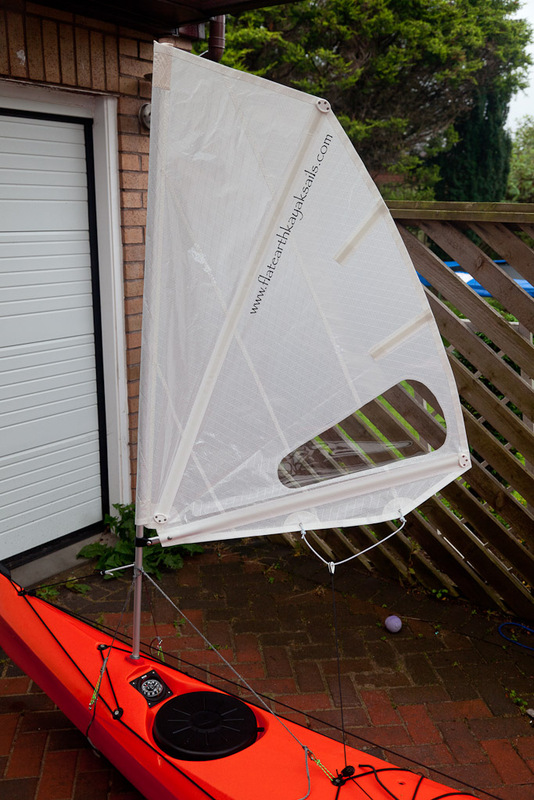 Four prototype sails for future models of Flat Earth Kayak Sails have been sent for final testing to Florida, Queensland, England and Scotland, and am I lucky to get my hands on the Scottish one? Kathy in Florida and GnarlyDog in Queensland are getting 1.0sqm versions but Duncan and I in the UK are getting 0.8sqm versions. This in no way reflects any inadequacy in GB paddlers but represents that we don't get steady trade winds. Our winds tend to be generated by low pressure systems and as a result are gusty. This sail is likely to be called the "0.8" (for 0.8sq m). The whole sail is made of what Flat Earth Kayak Sails call Code Zero cloth. This is a mylar/dacron laminate, which is reinforced by spectra threads. It is much lighter than either the standard all dacron sail or the XP sail, which is dacron reinforced with code zero material on the leech, like my blue/white sail. The current standard size sail is available in Code Zero cloth but this new sail has a completely different cut. 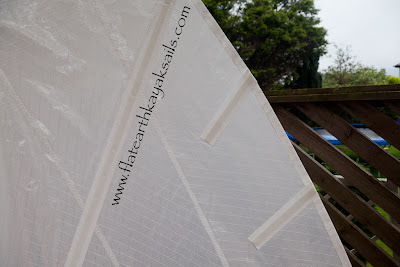 The new cut has oriented the panels and the seaming to encourage twist at the top of the roach but also to put more fullness into the luff than the previous sail. 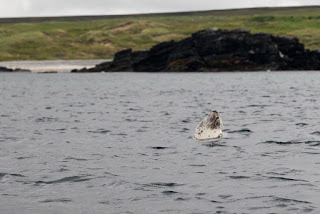 The length of the luff and the full length sprit batten are unaltered but area has been moved from the bottom of the sail higher up and appears as an extended roach in the leech between the top of the sprit and the clew. 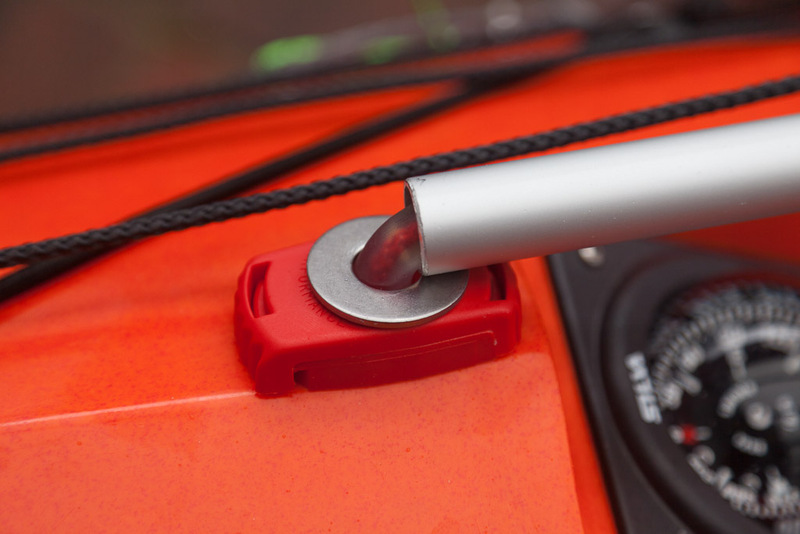 The roach is supported by two mini battens that are sewn into the leech. This effectively makes it a lower aspect sail and because the cut has also been altered to put a deeper draught into the sail (with the fullness well forward towards the luff) it should make it more powerful for its size. Because the mast length is unaltered, the centre of effort of the sail will be moved higher into cleaner air, which should encourage good clean laminar flow across the sail. I really can't wait to try it out. Please note these are prototypes and the final production version is likely to change before it is introduced some time in 2012. As it is likely that the current well tried standard sail will continue in production alongside the new sail for some time, I would encourage anyone who is thinking of taking up sea kayak sailing to go ahead and buy the standard sail now. 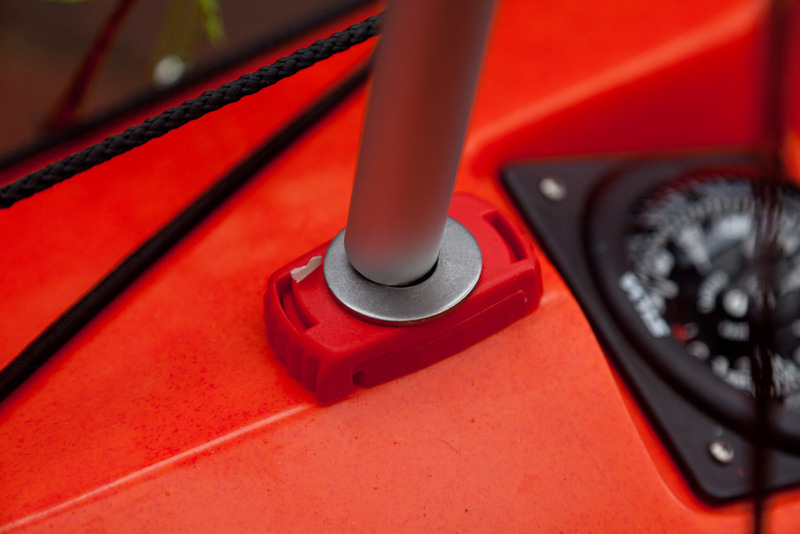 As the mast and fittings are the same, you could always upgrade in the future, by just buying a new sail. 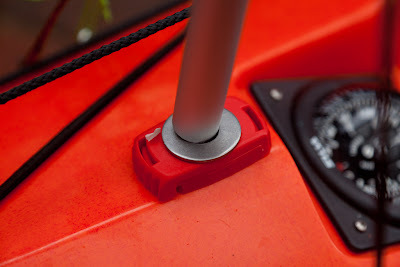 Talking of fittings there is also a new prototype mast foot. As you can see when the mast is vertical the mast rests firmly on a large penny washer. (It would rest even flatter if I had not mounted the mast base offset to avoid the inverted V of the Delphin deck!) This should get round the problem reported by some high wind sailors where the old tendon joint deforms under pressure loosening of the stays in the gusts. Yet when the rig is lowered, the tendon joint magically reappears! If you pull the mast back as far as the stays will allow, then you can see the secret. The tendon is fitted into a little stubbie (I think that is the correct strine description) mast that slides into the main mast. What an elegant design. 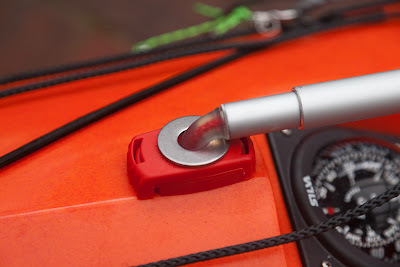 I think this new design will benefit even more than the current design from having two side stays at right angles to the mast and a back stay. So if you just use two rear mounted sidestays and no back stay, now is the time to get the drill out! Again this new mastfoot design is just a prototype, so Mick has instructed that I chuck as much sand and wind at it as I can. Delighted to oblige Mick! What bonzer news from Flat Earth Kayak Sails! This new rig looks a right bottler! 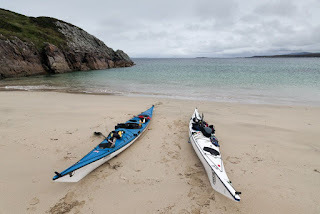 I am afraid I have not a single photo of our paddle under the cliffs between Cape Fear and of Ton Mhor at the north end of the wild Rinns of Islay. After closing with the rocks we got out of the worst of the counter tide race but the clapotits proved to be somewhat of a challenge to tiring paddlers. It was like hanging onto a bucking bronco! 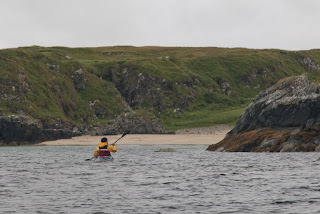 We felt some relief when we eventually turned the corner into the sheltered waters of the east side of Ton Mhor. 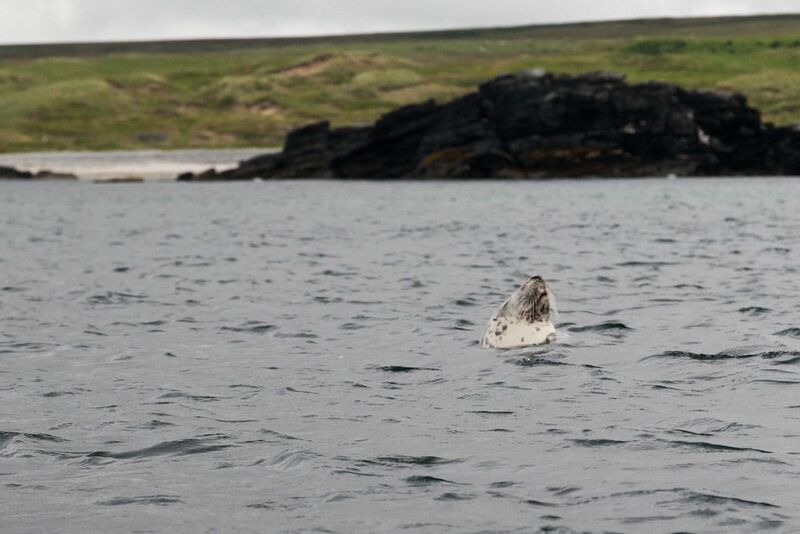 We were not the only ones to be tired, this large seal was fast asleep! We now made for the lovely sands of Port Gillhe Greamhair. 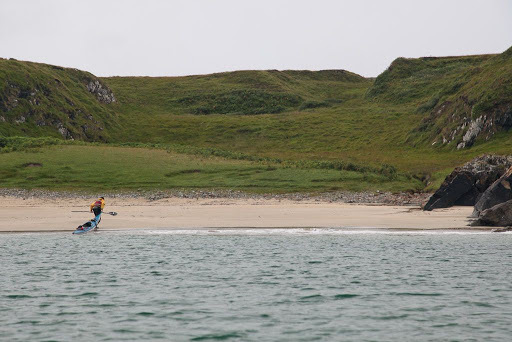 There was hardly a ripple of surf, unlike the time when Phil and I had turned back from here only 6 weeks previously. 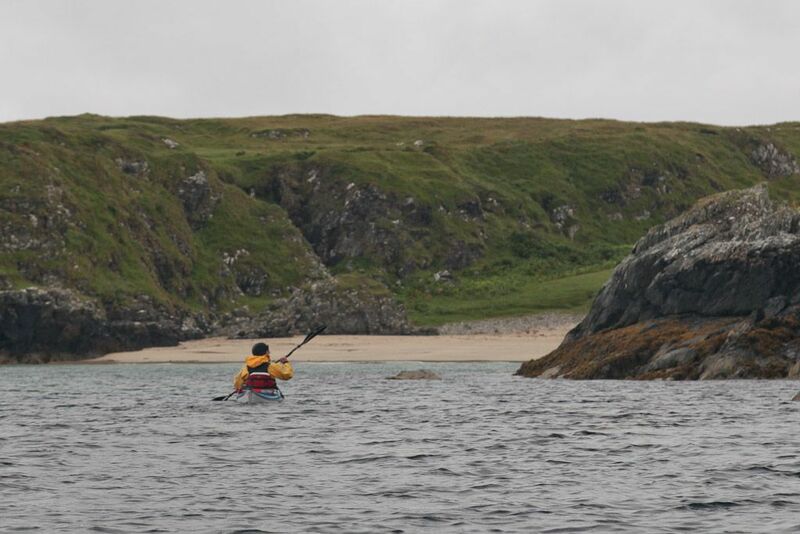 I stagerred out of my kayak, I could hardly stand, my knee had seized up after 25 km of some of the most challenging kayaking on the west coast. 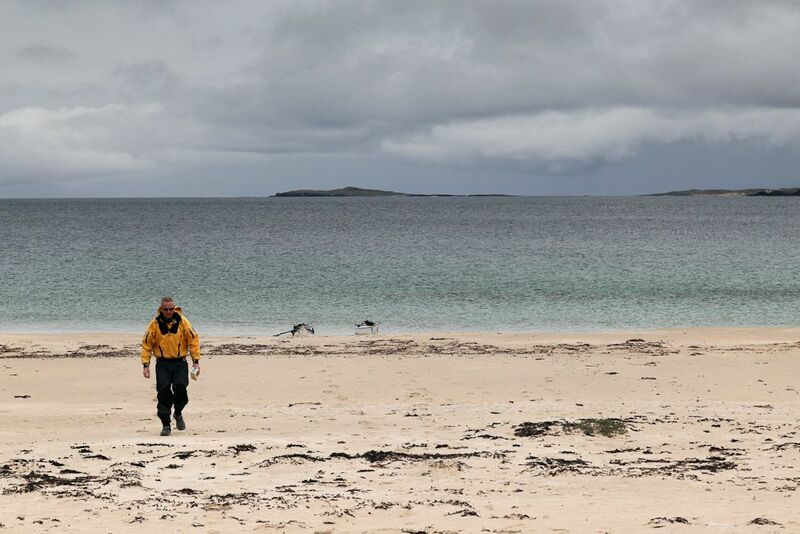 After enjoying our sandwiches on the machair at the back of the beach, we decided to have a little celebration. In his recent comment Ian said: "Character building stuff Douglas! I trust a moderate amount of strong drink was taken in order to calm the nerves after this passage? I should have thought it would require an 18 yr old to really do the trick...."
Ian knows me too well! I had some 18 year old Laphroig in my day hatch and Tony kindly went back down the beach for it. 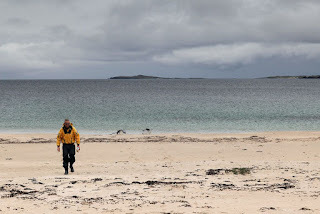 As we lay back on the machair for a well deserved rest and snifter of the spirit of Islay, the ground seemed to to be moving beneath us, as if we were still paddling a stormy sea. I can assure you it was it was nothing to do with the Laphroig!